A clogged kitchen sink drain is one of those things you don't want to have to deal with. Dirty water, can't use the sink and the family complaining. Your garbage disposal and dishwasher are also affected. What can you do to resolve the problem. Getting rid of the clog is the logical solution. For related information, see the articles 'How To Clean a Drain' and 'Sink Drain Plumbing'. Most kitchen sink clogs are fairly easy to deal with. The trap is a popular spot for clogs. Less often it will be in the short section of pipe that the drain is connected to. A short run with a snake will take care of the problem. Take a look at the information below and decide if you want to tackle a clogged kitchen sink drain. Use the evaluations section first and then check out the steps involved. If you still feel comfortable, go for it. Clogged kitchen sink drains are fairly easy to deal with. Many plumbing and drain cleaning companies have flat rates for removing a stoppage. That means no discount if it turns out to be a simple problem. It will probably run between $75 and $125 if it is not too difficult. There is usually a set time for the repair, when the serviceman exceeds that the meter starts running. Using a plunger is pretty easy. Running a snake through the line is more work. 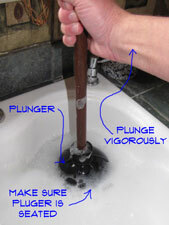 Using a plunger is pretty simple. I must warn you that plungers have limited effectiveness on kitchen sinks. I don't recommend drain cleaners. Nasty chemicals, the environment and the fact that they don't work that well. One problem with a clogged kitchen sink is that you have to take the trap off to run a snake into it. You can't tell when you have the problem solved and you can't run water into the drain while you are snaking it. You may put it back together and find out it is still clogged. Not getting things back together will leave the sink unusable. This is a messy job, take precautions and move or cover things that you don't want soiled. You have three levels of difficulty with a clogged kitchen sink drain. First is one that can be broken free with a plunger. This will be discussed in Step One. Next you have an entrenched clog in the trap. It won't break free with the plunger, but it is not hard to get to. See Step Two for this situation. Lastly you have a clog that is in the drain line. In no man's land, inside the wall or under the floor. Tough to get to. See Step Three for your next course of action. Before you get started you want make sure that you do not have a more serious problem. Is the sink the only fixture that is affected? When you run water in the kitchen sink does it try to come up in the toilet or bathtub drain? Is water coming up through a drain in the basement? Yes to any of these questions means the clog is in one of the main lines, a bigger problem. No to all, good! All you have is a clogged sink drain. 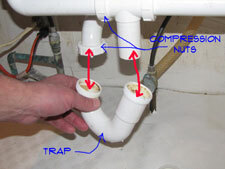 Removing the kitchen sink trap is going to be your likely next step unless the plunger worked. Grease is a common problem in a clogged kitchen sink drain. Grease is resistant to plunging. The first thing you need to do with a clogged kitchen sink is locate the problem. You can determine which section of the drain is the culprit by what is clogged. Is it just the disposal that is clogged? 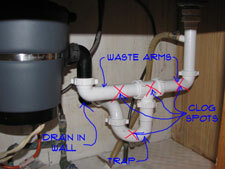 If it is see the article 'Fixing a Garbage Disposal Clog', for more information. Is it the other sink that is clogged? The problem is in the waste arm connected to the sink. Take that piece off between the sink and the tee. Are both sinks clogged? Then the problem is further on. Try the trap first and then as a last resort use the snake. Same principles apply for a kitchen sink. Apply pressure and turn the snake. Run it as far as you can and make sure you dislodge the obstruction. To remove the waste arm or the trap you need a pair of adjustable pliers and a pail. The trap will have water in it and the sink may still have water in it. Loosen the fittings and remove the likely culprit. This part is a little nasty, brace yourself. Check for a clog. Find one? Use something to get it out and dump it in the trash. Put the pipes back together. Use the pliers and tighten the nuts about a quarter to a half of a turn past hand tight. Do you have to replace some parts on the drain? See the article 'Sink Drain Plumbing', for some extra information. Often times, when everything else seems to be working fine, you’ll notice that your sink is clogged and you don’t know what to do. Should you call a plumber? Do you bug your husband and wait days before he could actually fix it? These are common scenarios that most households experience, and it’s always best that you’re equipped with information, especially with DIY methods, including ways on how to unclog kitchen sink. This is the most common and typically one of the most effective methods that are often being used when it comes to unclogging the kitchen sink. You need a small plunger (smaller than the ones you use in your toilet) and plunge vigorously until the drain has been cleaned. You need effort to be successful in doing this. Plunge the drain about six to ten times until you have noticed that the drain is cleared out. Repeat if necessary. Remember, you need to add a little bit of water on your sink and forceful plunges for this method to work. Kitchen sinks usually have two bowls. This makes plunging a kitchen sink little problematic. The extra pipe and the second sink tend to diffuse the pressure the plunger develops. It will still work for some clogs, but it is less effective on tougher ones. A plunger needs to develop pressure to work. If you plunge one side of a kitchen sink the pressure pushes out the other drain and the clog is unaffected. You have to hold the stopper in place on the other side. The better you stop up the other sink, the better your chances are. Make sure there is enough water to cover the plunger. Hold the stopper in place or have someone else hold it. Make sure the plunger is seated firmly around the drain. Plunge vigorously several times. Hopefully the clog has broken free and the water is draining down. If you answered yes you have successfully dealt with a clogged kitchen sink drain. Still clogged? Check and see if you have the other sink sealed good. Make sure the plunger is seated firmly on the flange. Give it one more try. Still no good? You will need to bring in the big guns, read on. You need to pour half a cup of baking soda to your drain, followed by half a cup of white vinegar. You’ll notice that an acidic reaction will take place, and finish it off by pouring hot water. You may have to repeat this option several times for this option to be successful. Combine half a cup of baking soda and salt and pour it into your drain. This method works best if you leave it overnight, so doing it before going to bed is ideal. The following day, pour approximately 2 cups of boiling water down the drain. Although the baking soda works wonders, if you don’t have the time to wait overnight or in a hurry, you can always go with commercial drain cleaners. The only downfall when using these is that you can hurt your hands and it may get burned when the agent touches your hands. Make sure that you’re wearing gloves and wash your hands immediately after using them. If you feel a burning sensation, you should immediately call your doctor. Using this is easy – just follow the instructions on the label, as the amount you need to pour generally depends on the brand. Most of the time, these commercial drain cleaners would you require you to flush cold water after pouring down the train for a couple of minutes, so make sure that you read the instructions as they may vary according to brand. This option is only ideal if most of the solutions mentioned above do not work. Take out the clean-out plug, usually beneath your sink (ring-like part). This is where most of the blockages are and manually take them out. You can use a plumber’s snake to take it off the sink or alternatively, you may also use a wire coat hanger. Water may splash once you've taken this part out so be ready as you may get wet. You’ll need a bucket for the liquid and goggles too. Among all the other ways on how to unclog kitchen sink, this is by far the most time-consuming and difficult, so only go for this one if you know how to remove the clean-out plug and if you’re confident that you can put it back easily. If you've noticed that your sink is not completely blocked, but water flows very slow, hot water usually does the trick. You can try this option before any other else mentioned above. If it doesn't work, feel free to choose one of the options to unclog your kitchen sink. Regardless of your choice, be sure that you’re careful and be prepared to get wet. Put on some working clothes and wear gloves just for your own safety.